Nothing like a bit of ambition. So when our Barrister neighbour announced he was going to attempt his first barbeque, featuring Indian kebabs he had never previously attempted, for an important weekend luncheon party, I couldn't resist offering my services. Not before I'd told him he was bloody nuts, of course. Feeding people is fraught with problems at the best of times. Feeding important people, with untested recipes, using an all new contraption is a whole different ball game. And then there are toddlers to consider. Take the normal neighbourly Sunday lunches we've taken to hosting for each other for instance. I cook a simple homecooked Indian meal in advance. Crack the quality booze open. Everyone else talks while the kids try to poke each others eyes out with different implements. Every now and again we put one of the combined force of four toddlers in a naughty corner/naughty step to momentarily break the delirium. In their house, things can take a slightly different shape. A giant chunk of exceedingly good quality meat gets shoved into the oven, with braised vegetable accompaniments. The cook offers quality booze. The rest of us talk, while we prevent the toddlers from shoving their faces in the oven. And repeat aforementioned disciplined techniques. The stakes were clearly higher at this barbeque. So we got the kids in bed and met to discuss the essentials. My top tips for Indian kebabs were: 1. Don't spend a fortune on meat. No one will notice the difference between organic, hand reared, tenderly loved lamb and a free range number you managed to source easily from a local supermarket/butcher. That's the power of spices. 2. Do get meat tenderiser powder. This is readily available in shops and online. Fear not, it's just papain, or dried and powdered papaya enzyme. Seeps through meat (particularly chicken breast) to make it the softest, juiciest chunks you have come across. 3. Keep the oil handy. Instead of putting it in the marinade, keep melted butter or flavourless oil mixed with lemon juice handy to baste the kebabs as they cook. If like me, you forget this important step, go back to spice power point of bullet 1. Also take another sip of said alcohol. I then proceeded to send him a bunch of recipes to mix and match to create Chicken Shashliks and Lamb Seekh Kebabs. One didn't have instructions for what to do with the ginger/garlic in the ingredients and one asked for spices unavailable in our local supermarket. Stellar job there. Not. The good news is the kebabs were a success and they are still talking to me. I will make it up eventually by inviting them over for the Masala Lamb Chaanp recipe I have been perfecting. 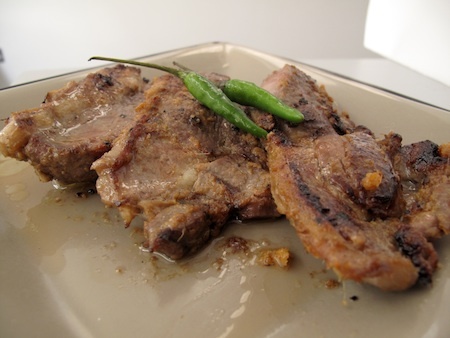 I have also been using thin cut steaks to make these masala lamb chops. The recipe uses just five ingredients, and is just as good under a grill as on a barbeque. Just the kind of simple entertaining that always gets my vote! Mince the onion, ginger and garlic together in a food processor and tip into a shallow serving dish. Mix the paprika, salt and Worcestershire sauce into it and taste to make sure the marinade is strong and pungent. Now lay the lamb leg steaks in the serving dish, coating them liberally with the marinade.Leave this to sit for as long as you can, minimum an hour and maximum overnight. When you are ready, cook the lamb steaks for about eight minutes on either side. You want this to be well cooked through as the raw masalas won’t be as good as when cooked. Baste with the oil if using a barbeque, or dot the oil on top of each lamb steak before placing under a medium hot grill. Flip over once during cooking. Serve this with a simple pulao and raita, or a root vegetable mash for a quick weekday dinner. a) The cheap meats are laden with anti-biotics and hormones. Which will go into your body and the bodies of your kids. No matter how powerful the spices are. b) The animals suffer unnecessary harm just so you can pay 50p less for your pound of flesh. Hilarious tips Mallika! I loooove lamb and this is such a quick way to make chops, will definitely have to try this! Thanks for the great grilling tips, Mallika! Are you sure you’re not part Australian or American? 😉 Off to buy some meat tenderiser powder — I may not have a BBQ, but my grill pan is calling to me! Thanks guys! @Ann Mah I am definitely all Indian and @ Saif the two green chillies would be fab addition! @Arti There is a BIG difference between factory farmed, antibiotic pumped cheap meat, and the top end of the very best available. I am merely advocating the middle ground for Indian BBQs. I wouldn’t insult the intelligence of my esteemed readers by assuming the don’t understand the difference. Hope this helps clarify somewhat. You made making Sizzling Masala Lamb Chaanps seem so simple! Would you join us in our food community http://www.mycookbook.com and let us know how you worked on the Sizzling Masala Lamb Chaanps perfectly ? makes the recipe all the more enjoyable! As always I want to try everything you post. Lamb is my favorite meat ever, but it tends to be very expensive and hard to come by where I live. We bought a whole lamb from a local farmer last year, but it is all gone now. 🙁 I may have to make this with beef before the summer grilling days are over. Thank you Mallika for sharing this delicious recipe of Lamb Chaanps, It is delicious and We tried it earlier today. my younger sister who is very diet concious loved it and insisted my wife to prepare it again this weekend. Great items from you, man. I have consider your stuff previous to and you’re just extremely excellent. Hi there, this weekend is nice designed for me, since this moment i am reading this enormous informative article here at my house. Instead of Worcester Sauce try Henderson’s Relish, which is similar but has that extra “something” that just brings out the best in meat based dishes, especially Indian spiced dishes.